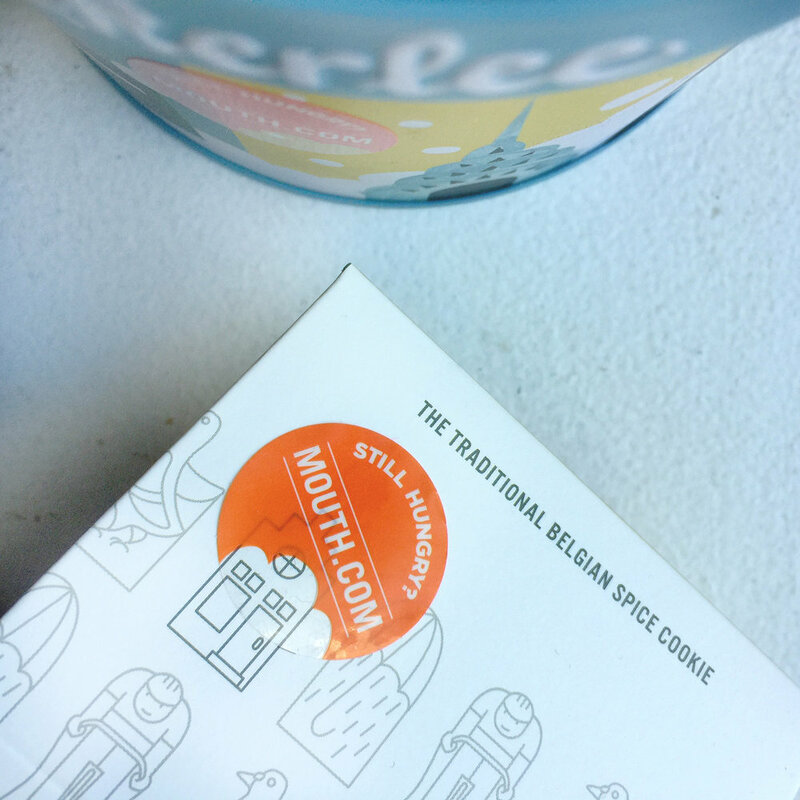 Mouth is an online retailer for craft food and drink, all made in America. They also offer monthly subscription boxes, with a different set of themed and curated products in each box every month. The goal was to create a more educational monthly box experience for customers, and create a streamlined way to delivery stories to each box. We evolved our subscription cards from just a theme name and month number, to a sheet filled with maker stories, recipes, and product contents, so the customer has a better sense of where their new snacks come from and why we curated this box for them. Mouth's Press page had been updated frequently with note-worthy articles and features, but as the mentions grew, the standard HTML list of hyperlinks grew and became hard to track quality over quantity. 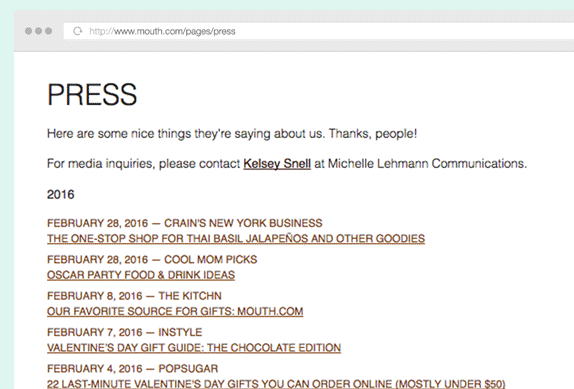 The re-design of the Mouth press page aimed to let the best accolades and quotes shine, to give customers clearer reasons to trust Mouth.com as a great food gifting destination. The footer still features all previous years and archives, in case others would like to do more research. My new revisions to the email design process at Mouth involved optimizing designs for mobile viewers, introducing more HTML for better clickthrough rates, streamlined MailChimp templates, and overall improved legibility with bigger images and text. • Have a Sweet Year, Honey! When customers order individual products on Mouth, the fulfillment warehouse places "re-order" stickers on the package, to remind customers to go to the site to make another purchase. This sticker was printed on a thin kraft-colored rectangle, often blending in with the packaging itself and in a small font that was tough to spot. Inspired by Mouth's name, I designed bite marks into the orange circle, for a witty element to a standard sticker. For printing and assembly efficiency, the design is still a full orange circle, inked on a clear plastic, giving off an illusion of a die-cut sticker. The new sticker design is modern, confident, and friendly. It now sticks well on all product surfaces (paper, plastic, metal, oh my!) and stands out on a package in a fun informative way without stealing the show away from the makers' beautiful package designs.